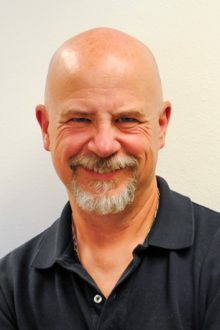 Bob Niemeier has been working primarily in Angel Fire for the past 5 years and strives to be a communicator, an educator, and an excellent physical therapist. He has advanced training in the performance of Functional Capacity Evaluations, the McKenzie Method of working with lumbar, thoracic, and cervical issues, and is particularly well versed at treating people that have vestibular or balance-related problems. He is skilled in helping with the recovery of function after orthopedic injuries and resulting surgery. He works closely with orthopedic surgeons in the area assuring complete recovery from shoulder and knee surgery. In his free time, Bob enjoys hiking, dancing, cutting wood, gardening, and playing Frisbee with his dogs. Bob founded the Disc Dogs of New Mexico Club to promote the sport and has shown his dogs in several exciting venues including the Albuquerque Balloon Festival.